I was browsing through Chris Ellis's booklet on narrow gauge modelling recently, and came across a half-page piece on the possibilities of modelling American 3ft gauge on 16.5mm track, using 1:55th scale. As it happens I have a spare Lima 0-4-0T which runs nicely, as well as a Bachmann Plymouth. Also in stock was an HO Caboose chassis, and I managed to pick up a couple of cheap HO boxcars at the Dulwich show. Time to start an evaluation today has produced the partly complete freight cars shown in the pictures, along with the 0-4-0 for size comparison. The boxcar's dimensions are based on a drawing of a Cairo & Kanawha car, which appears to be on the smaller end of US 3ft stock. The gondola is as it came, but with several bays taken out of its centre to give it an overall length of about 24ft. The other newly acquired car is a 40ft metal gondola, slated to become another boxcar. So far it seems quite promising as the nucleus of a collection in a new scale. Some of the smaller Bachmann On30 offerings could easily pass for 3' gauge in 1:55 scale rather than the manufacturer's intended 2'6" in 1:48. 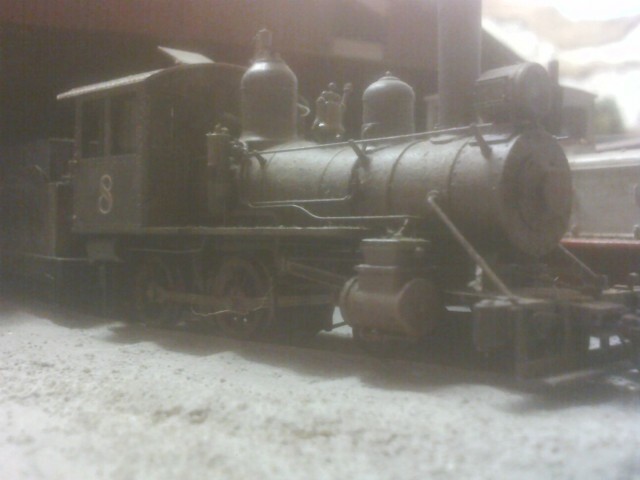 FCPyF #8, a Bachmann 4-4-0, was on shed at Grande for repairs to a damaged slide bar when this photo was taken. I hadn't thought of scaling down, Bob. Thanks for the thought - some 3ft gauge locos were pretty small, as you say. As far as a possible layout is concerned, I'm mulling over whether a 4by1 shunty plank could be multi-moded between HO and 1:55 - with drop in buildings for either scale. So far, it doesn't look impossible and is a better bet than the US/UK multi-mode under consideration recently. At present I'm concentrating on 1:55 rolling stock and people, as the latter were part of the undoing of my Java project a few years ago. I have obtained some 1:50 scale people, who are a little too tall, but whose poses look capable of modification to a shorter height. I'll look at that once the three freight cars have been finished. Meanwhile, here's a comparison shot between the converted gondola and an unconverted HO one, showing the difference in lengths. Could do, Alastair, except for one major fact - most US narrow gauge was 3ft, which 1:55 provides exactly. Besides I've done Sn3/3.5 before, and wanted to try something new. Not forgetting Siku do a range of 1/55 road vehicles. Obvious 16.5mm gauge is spot on for 3ft gauge, although I am planning to stretch that to metre gauge. You can even find civilian figures(French resistence an example).Some find figures a bit chunky, I like to think they are characters! Giles I understand that some of the the superb MODELU figures (from the Pendon range) are available in 5.5mm scale at £4.25 each. That may sound a lot - but how many do you need and they are excellent. I've had a little success shortening the architectural figures I've found. It's quite fiddly but, as you say, I won't need many of them. For wild west figures, just google them online. Lots of different companies doing them, with many UK based so easy to get hold of. Modelu figures. There was a bit of pressure put on them to get the 1/55 version of the Pendon figures. That is possibly why prices not listed. The potential for 1/55(28mm) figures is probably even better for the wargamers. Of course you can always get yourself scanned(only takes 5-10min at exibitions), and then you can appear on any layout in any scale! Even wargamers could have themselves in their games. 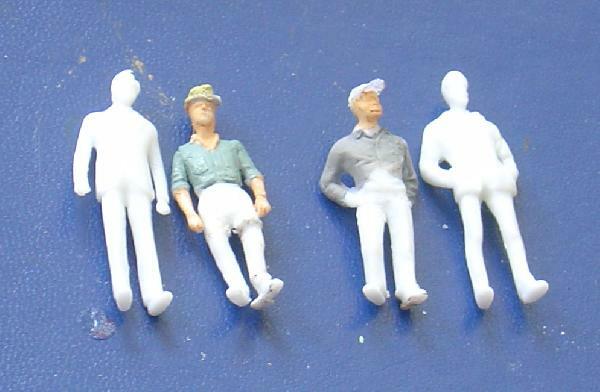 The first of the cut-down 1:50th figures - the white ones show what the smaller ones were like before surgery. I also have another figure the correct height made by combining the body of a seated figure with a pair of "standing" legs, which gives someone leaning on a wall and looking over. If you compare the height to the shoulder you can see how much has been removed, by taking a little from above the waist and a bit from the legs. The left-hand figure also had his upper arms shortened a little. He still needs a bit of attention to one leg, but both can stand up unaided, which is a good test of a figure's pose, I find. Having got this far, I compared the converted figures with some Slater's 7mm scale people, who I've always thought were a bit on the small side. They come out only a little taller than the 1:55 ones, and so may provide some different tops and bottoms to vary the gene pool. The two railway staff could be useful as a Conductor and Depot Agent, if re-posed and given US style pill-box caps. Although some will debate it, but think some of the figures Lledo had in early models were near to 1/55. Possibly more victorian than USA. I had some a few years ago, but passed them on. My memory is that they were British in style and roughly 1930s-1950s in period - and 1/64th scale, being a little bigger than 00 figures. I think some others were Victorian (if sold with steam lorries and other earlier vehicles). 1/64 is not that much smaller than 1/55. Many of the old Lledo vehicles are used by 28mm wargamers. Also remember people come in diffeent sizes, although many of those done for 28mm wargaming seem to have been eating a bit too much! What puts some off the wargaing figures is that most have been military, or at least holding weapons, but there are far more cvilian ones, partly because of games set in 1930s gangster USA , even some road vehicles to those. Thinking of where the new rolling stock might run, I checked my wood supplies and found a forgotten piece of plywood 48 by 9 inches. Some shuffling about with turnouts and some rolling stock showed that a layout could be made to fit, but at the expense of extremely basic scenery - all the buildings being merely flats along the back-scene. Siding capacity was also rather limited. Adding either three inches in width or six inches in length helped considerably, the latter allowing for two more cars in the sidings. If I use some damaged points, that will need Wrenn point levers to work them, there will still be the correct list of turnouts available for the GWR/SR project. Because of the way the points are "handed" the plan has had to be flipped from left to right, and it was only after this that I realised the layout is Chris Ellis's "Tragbar", in a new guise. This seems quite fitting as the original idea was to make an extended version of one of his last layouts to be presented in MTI. Spent a little more time trying out possible buildings for both scales, using the left-overs from Lazy River and some unused kit parts. This is a rather rough and ready record of what the left-hand end of the layout could look like, if all the buildings are raised up between 6 and 12mm. Doors will need enlarging and some of the windows will be replaced by more typical 4-pane glazing.The building on the right is probably OK as it is, and now is a small derelict shed, rather than half a warehouse as it was in HO. The back-scene makes use of some photos I took on holiday in New England a couple of years ago, and there are some others to make the scene longer. Off to the right of the second picture there is a wharf on the far side of the tracks, with the freight house and passenger depot (very small) on the near side of the line. There will be space to park a boxcar at the freight house and still have room for a locomotive and two cars before the wye point in either scale. The sidings in the left foreground take three and, because of the lead in curve, two cars - which is also the capacity for the siding with the red gondola.